I’ve known Dr Sue Black OBE for several years, in her various guises as women-in-tech evangelist, campaigner to save the British wartime communications centre, Bletchley Park, Twitter maven and hot-pink-haired dynamo. Sue has had a remarkable year. The technologist has published a book, played mother-of-the-bride, turned Grandma for the first time, was named one of the top 50 computer scientists in Europe, been honoured by the Queen of England and got engaged via an encrypted message using 70 year old code. And that was all in the first three months of 2016. It wasn’t until she and I had a conversation that I discovered that her story was anything but a fairy tale. Her professional accolades and personal triumphs come after a lifetime of escape and of survival. She can’t quite pinpoint what’s given her such strength, but we have a theory. 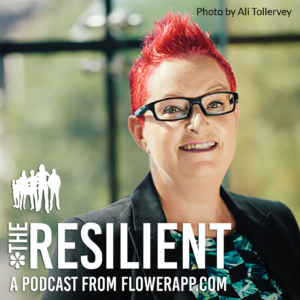 This entry was posted in The Resilient and tagged Aleks Krotoski, domestic violence, Dr. Sue Black, interview, podcast, resilience, technology. Bookmark the permalink. aleks krotoski is back. happy days! I visited Bletchley Park last year, and as fantastic as the history of the base and the work of Turing and WWII intelligence was, I think I was even more blown away by the computer history museum appended at the back of the facility, I had an old timer explain the logic of the colossus machine in extraordinary detail. learned about SDR radios from a retired secondary school teacher volunteering there. Blew some school kids minds by typing and running 2 line a for/next loop counter on a bbc micro that they were struggling to get working. played an original pong machine and used an SGI IRIX workstation. As a computer nerd, I felt like a kid in disneyland there. Thanks Sue Black for helping to make that place exist.